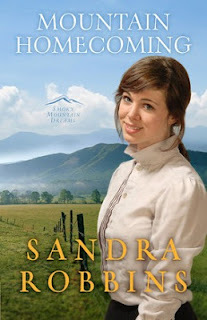 "In the second book in the Smoky Mountain Dreams series, acclaimed author Sandra Robbins spins a tender tale of God’s faithfulness throughout the generations. Is there a place for Matthew in the Cove? And can the light of Rani’s love overcome his pain?" Rani Martin has grown up in Cades Cove, a small valley in what is now the Great Smoky Mountains National Park. Matthew left after his father died and has experienced a rougher life outside the Cove. When he returns to his childhood home, Rani is the first person he meets. His father was an alcoholic who died under suspicious circumstances. The people of the Cove remember his father's failings, making them suspicious of Matthew. His father's killer is still around and makes trouble for Matthew and Rani. She falls in love with him regardless. He feels that she deserves someone more like herself, someone who grew up in Cove with a loving family and no skeletons in the closet. As with most romances, they get together in the end. It's an enjoyable story, and the characters are quite believable. The author does a masterful job of setting the scene and pacing the plot. Although I'm sure it helped that I've visited Cades Cove, she made it come alive for me. The first installment was Angel of the Cove, which I reviewed earlier. You don't have to read them in order, but it helps to know that Rani's parents are the hero and heroine in the first book. Disclaimer: This book was not provided to me by the publisher or the author.